This spring Upper Green Side will be participating in a new endeavor to help make the Upper East Side a less hazardous place for pedestrians and cyclists. The East Side Streets Coalition is a community-based effort to engage citizens and civic organizations from East Harlem to Chinatown in creating an East Side Action Plan for pedestrian and cyclist safety improvements throughout the entire East Side of Manhattan. Between the years of 1995 and 2005, almost 200 bicyclists and pedestrians were killed and 19,481 bicyclists and pedestrians were injured as the result of traffic crashes on the East Side. The overarching goal of the East Side Streets Coalition is to reduce pedestrian and cyclist injuries and fatalities from vehicle crashes by 50% over the ten year period of 2009-2019. A series of neighborhood workshops throughout the East Side will inform the East Side Action Plan in identifying safety concerns and potential solutions. The Action Plan will summarize months of East Side community input and Department of Transportation crash data. It will also outline community identified and traffic engineer reviewed solutions to improve pedestrian and cyclist safety as well as transit access on the East Side. The coalition is based on the concept that streets are more than just car corridors. They are valuable civic spaces, a precious resource which must be wisely allocated and made safe for pedestrians and cyclists. 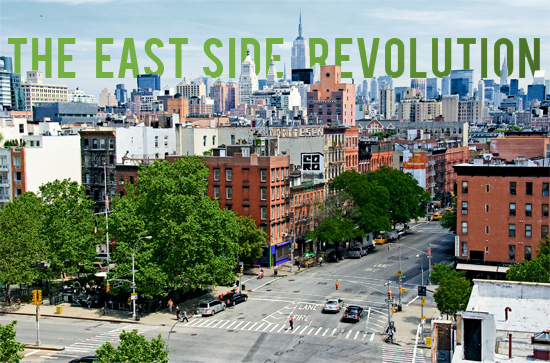 The East Side Action Plan is an effort to re-imagine the East Side of Manhattan as a place safer for people traveling by foot, stroller, wheelchair, bike or bus. As a Coalition member you and/or your organization will help to identify problems and solutions to creating safer streets and increase awareness of the East Side Streets Coalition among East Side stakeholders. Coalition members will have the opportunity to sign-on to and sponsor the East Side Action Plan when it is publicly launched in September 2010. The East Side Streets Coalition is comprised of organizations and institutions on the East Side working to develop an East Side Action Plan focused on reducing pedestrian and cyclist crashes on the East Side. A series of neighborhood workshops, open to the public, will take place between March and May. If you work with an organization, institution or civic association on the East Side and would like to learn more or get involved, email julia@transalt.org. Check out Our Town’s article here. Great post, Mike. Much of the problem is that there is no East Side bike path. First Avenue is listed as a bike route, but everyone knows that is a joke because it is scary and dangerous. I wonder if there will ever be a way to get the river path to go all the way up, including past the UN.